The April 15th Rainout between Our Washington Nationals and The Defending Champion Philadelphia Phillies has been rescheduled when The Phillies return to The Nation's Capital in Mid-May. On Saturday, May 16th, the make up game will be played beginning at 1:05PM. Season Ticket and partial plan holders can use their original April 15th game tickets for entry to the afternoon game. Individually purchased tickets for Game 2 of the 2009 Home Schedule can be used for that game also, or exchanged for another home game in 2009--except The Boston Red Sox Series. The 7:05PM regularly scheduled game will also be The Jackie Robinson Tribute Night. For the evening game, both teams will wear Jackie's now retired Number 42 on every uniform. Separate admission is required to attend both games.Complete details in the press release below. Although not mentioned is pre-paid parking. Last year, fans were allowed to use their parking pass for the rainout game for the rescheduled date. I will make an inquiry to find out for sure. 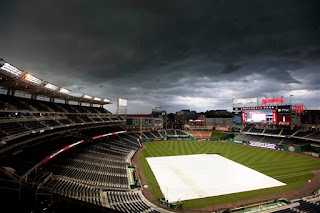 The Washington Nationals today announced that their postponed April 15 contest vs. the Philadelphia Phillies has been rescheduled as a 1:05 p.m. afternoon contest on Saturday, May 16 at Nationals Park. The rescheduled game coupled with the regularly-scheduled 7:05 p.m. contest that night gives baseball fans access to the first weekend version of a day-night doubleheader at Nationals Park, which opened in 2008. The two games against the World Champion Phillies on May 16 require separate admission. Fans purchasing tickets to the 1:05 p.m. afternoon contest on May 16 vs. Philadelphia can take advantage of Value Game pricing, as most tickets are reduced up to $5. Tickets for this game will be available at the Nationals Park Main Box Office starting on Thursday, April 23 at 10:00 a.m.
Jackie Robinson Day, originally scheduled for April 15, will now be celebrated prior to and during the 7:05 p.m. contest on May 16 vs. Philadelphia. Both the Nationals and Phillies will don No. 42 jerseys that evening to honor the legacy and spirit of the man responsible for breaking baseball’s color barrier in 1947. The first 10,000 fans at this game will receive a commemorative No. 42 Jackie Robinson button. Season ticket and mini-plan holders, whose ticket plan includes tickets for the postponed April 15 contest, should retain their tickets for use during the 1:05 p.m. afternoon contest on May 16. Those with individual-game tickets (all non-season and non-mini-plan tickets) to the postponed April 15 contest may use those tickets for the same seats to the 1:05 p.m. contest on May 16 or may exchange their tickets for any other future 2009 Nationals regular season home game, excluding the three-game series against the Boston Red Sox on June 23, 24 and 25. All rain check exchanges are subject to availability. It was great seeing you both on Sunday and thanks for the help in the Team Store! When we got to the garage, the gate was down but the attendant had waited for us. We have got to stop closing down the park. It was fun seeing you again. Our next game is the 30th. Bummer for those folks with rainout tickets who thought they were going to get the Jackie Robinson promotion. Why do you think the Nats are giving it to the night game instead of the makeup day game that was originally supposed to be the promotion game?